This tutti frutti bread is perfect for breakfast.... flavoured with orange juice and zest. The flavours are well balanced and not too sweet. It is also very easy to make. Here goes the recipe. Tutti Frutti ... 1/4 cup or more if you like. Clarified butter for greasing the tin. Take half cup warm water and add sugar to it. Sprinkle yeast on top and leave it in a warm place until it becomes frothy. Extract juice of orange and grate the zest. We will use as needed. In a large bowl take the flour. Make a well and add the egg. Sprinkle the salt and sugar on the sides. Mix gently adding the yeast and later the zest and juice of orange as needed to make a soft dough. This step is very important to get a nice fluffy bread. Put the dough in a greased bowl. Cover it and place it in a warm place to rise until double. Take the risen dough on a floured surface and flatten it. Spread the tutti frutti and candied orange pieces. Roll it and knead it gently so that the pieces are well distributed. Make a roll and put it in 8" by 4" greased loaf tin. Brush with egg white or milk. Leave it to rise again until double. It takes about 2 hours. Winter it takes longer. Pre-heat the oven to 200 C (400 F) and bake it until done. It Takes about 30 - 35 minutes. The time may vary a little according to the size and type of oven you are using. So keep an eye. Remove it and let it cool before slicing. 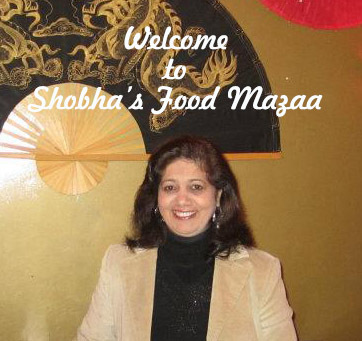 Shobha that's a lovely loaf of bread. The orange flavoured bread does taste absolutely yummy. Yes Mayuri.. tastes awesome ! nice texture,useful step wise pics ..this bread is so gud fr morning break fast.. Anytime of the day dear.. kids will also love it. Then she will love this one too . Whaa fun looking bread. I bed kids would love it! 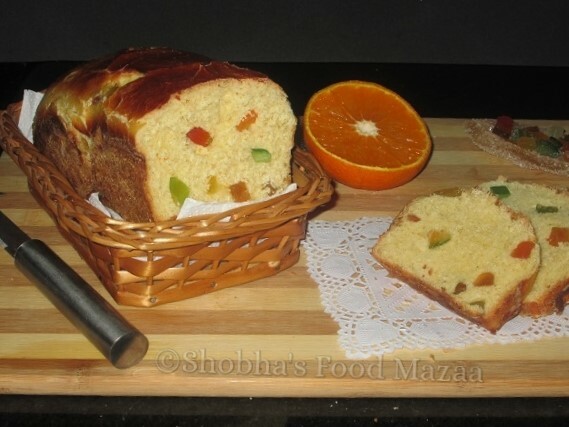 Your Orange Tutti Fruiti bread looks lovely, Shobha! It would be perfect with a cup of tea. Pinning and will tweet. Thank you for being a part of the Hearth and Soul hop.